UK powered access rental company Star Platforms provided six 28m Niftylift Height Rider Hybrid (HR28H) articulated boom lifts to complete the refurbishment in Kensington, London where it was essential to keep noise pollution to a minimum. Located just a few minutes from Kensington High Street, the Kensington Green residential area is set in a nine-acre site with tranquil surroundings and beautiful landscaped gardens. 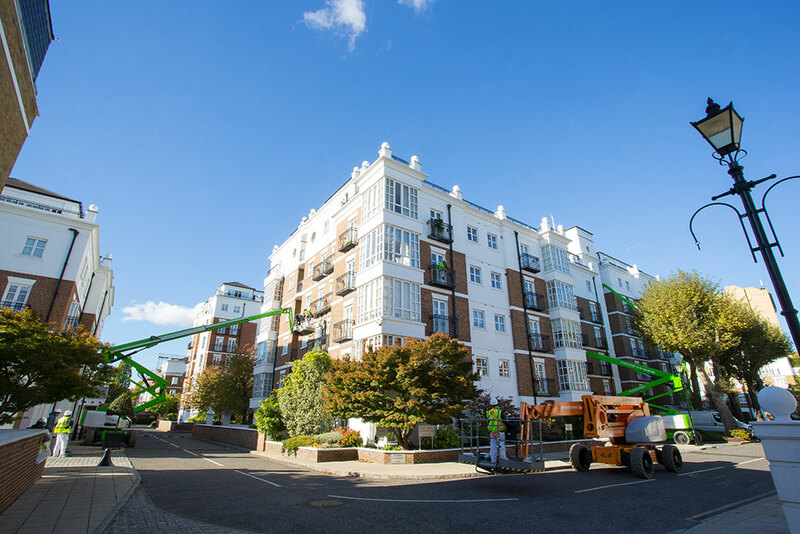 The luxury apartment buildings and homes needed an exterior refresh to the paintwork, fixtures and fittings, and it was essential the project was finished with precision and accuracy with minimum disturbance to the residents. The refurbishment contractor wanted a powered access platform supplier with a large fleet of 28m articulated boom lifts, and contacted Star Platforms so they could work with one supplier on the project. They required articulated boom lifts with electric engines to enable them to reach up to the top of the high-rise buildings and over any obstacles on the ground, whilst minimising the noise pollution for residents during the refurbishment. After a thorough consultation, and site visits to fully understand the project and needs of the customer, six 28m Niftylift Height Rider (HR28) Hybrid articulated boom lifts were chosen to facilitate the refurbishment. The revolutionary hybrid engine of the HR28H articulated boom lifts can operate on battery alone, making them ideal for indoor, quiet or clean applications. The HR28H also comes with four-wheel-drive offering extra stability for the operator when using the machine outside and working at height, especially on uneven terrain such as cobbled roads and pavements. With a working height of 28m, maximum outreach of 19m and machine width of 2.49m, the Niftylift Height Rider (HR28) Hybrid articulated boom lifts enabled operators to reach all areas of the buildings including around corners and in the alcoves of the architectural design with ease.